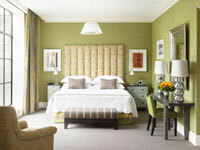 Luxury boutique hotel group Firmdale Hotels is to open a New York property on September 29. The 86-room new-build Crosby Street hotel is located in the Soho district and is the first property outside the UK for the London-based group, owned by Tim and Kit Kemp. Firmdale is a member group of Design Hotels and its portfolio includes the Soho, Haymarket and Knightsbridge hotels and Number Sixteen. Like the other properties, Crosby Street’s interior is designed by Kit Kemp with a quirky, modern look using rich colours and textures and handpicked antiques and art. The individually designed bedrooms have high ceilings and plenty of natural light, with most having city views. They are fitted with flatscreen TVs, wifi and DVD/iPod players, while the bathrooms are designed in granite, oak and glass. Hotel facilities include the Crosby bar, which serves food and drink all day and opens on to a central garden courtyard, and a 24-hour gym. The lower ground floor houses a 99-seat screening room and three meeting rooms, and the whole floor can be hired for gatherings of up to 300 people. In common with the group’s other hotels, Crosby Street also has a residents-only lounge and an unmanned “honesty bar”, where guests can help themselves to drinks and nibbles and mark on a pad what they have taken. Visit firmdale.com for more information.